Product information "Danfoss Link - Starter Package"
The Danfoss Link™ system is a programmable, wireless control system for heating systems in residential buildings (up to 300 m²). 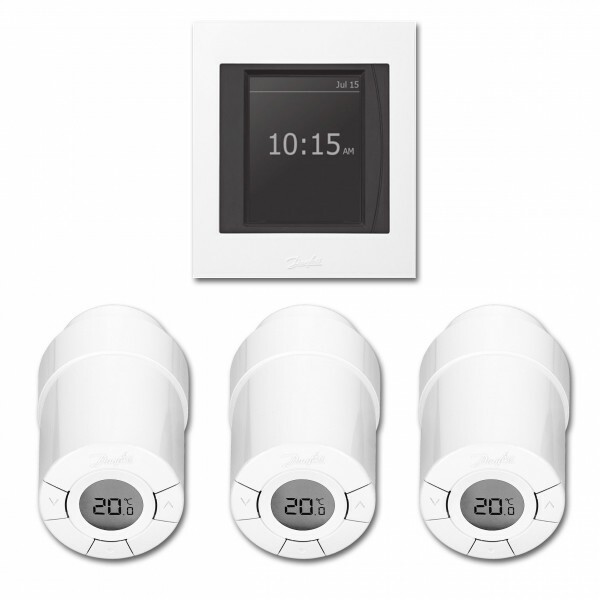 With the Danfoss Link™ starter package, you can connect wirelessly three radiators with the intelligent Link™ Connect thermostats and the also included Link™ CC control center. The Link™ starter package can be extended anytime with additional Link™ Connect thermostats and other components from the Link™ product family. This way, you can integrate further radiators or a floor heating into the Danfoss Link™ system as well. Danfoss Link™ devices are NOT compatible with Z-Wave devices. Related links to "Danfoss Link - Starter Package"